We have all heard about the man who got rid of hisbackache after someone told him to put something in his shoe to make his hips more level. Well, it does happen that some of us grow one leg longer than the other one. Is it really important to have level legs? If the legs have always been different lengths, why does the back suddenly start to hurt? The answer lies in the fact that the leg lengthdifference causes a tilt at the bottom of spine and is constant stress to the balance of the skeleton. Sooner or later, because this delicate balance is disturbed, the area becomes painful. "Anisomelia" by definition is a bilateral asymmetry in lower limb length, also referred to as "Leg Length Inequality", (LLI). Click here for further information on this conditionSome of my patients are unaware that one of their legs is shorter. This usually causes problems in their knees, pelvis, back and neck. There are a number of reasons for this. Some of the leg length differences are permanent or "anatomical" and some of them are reversible or "functional". Most of us think the average human body is symmetrical; that if you drew a line down the middle of the body, the left and right halves would match. In fact, there is some degree of asymmetry - inequality - in everyone.Leg Length Inequality (LLI)- where one leg is either anatomically or functionally shorter than the other - is classified as a "normal variant": something that is so common, it isn't surprising when it turns up. History:Knowing how the symptoms first started will help chiropractors to decide whether the level of the hips is relevant. The symptoms being worse when standing or walking suggests that the level of the legs is exacerbating the condition. Examination:This is the most important stage of the diagnostic process. The chiropractor will look at the level of the hip bones and the effect this has on the shape of the spine, particularly in the lumbar area. more accurately the relationship between the leg lengths at the level of the hip joints, the level of the hip bones and the level of the sacrum, the actual base of the spine. They help to determine the long term effects on the spine. From this, the chiropractor is able to diagnose more accurately whether the tilt should be corrected or simply stabilized. Heel lift test:There are various tests to determine whether it will be useful to level the sacrum. The easiest way is to place a 'raise' inside the shoe. The raise height must be determined accurately to ensure maximum benefit. X-ray measurement is one possibility and can be useful when the changes in the spine are few. 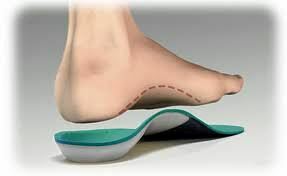 the heel lift will be reduced to the minimum needed for maximum effect, the eventual aim being to have no lift if possible. Conclusion:There are many other problems of the lower extremities that are not mentioned here. Chiropractors specialize in the mechanics of the skeleton and can recognize these problems which places them in an advantageous position to give you appropriate advice and care. Chiropractors look at the interaction of all the joints of the leg and pelvis and understand how they affect each other. They will try to correct the problem by conservative means first, in other words, by ways that do not involve surgery.